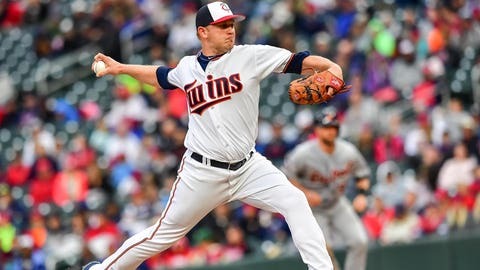 The Minnesota Twins tweaked their bullpen Tuesday afternoon, recalling right-hander Tyler Duffey from Triple-A Rochester and optioning left-hander Andrew Vasquez to take his place with the Red Wings. Duffey has made three appearances in Rochester this season, allowing two hits and one run in six innings while fanning 11 hitters and walking three. Last season, Duffey logged a 7.20 ERA with 19 strikeouts and four walks in 19 appearances with the Twins. Duffey was groomed to be a starting pitcher early in his big-league career and made 36 starts for the Twins from 2015-16. But he spent most of last year as a reliever in Triple-A, registering a 2.90 ERA with 63 strikeouts in 59 innings pitched. Vasquez, who was recalled last Wednesday, appeared in one game for the Twins this season and allowed three earned runs and walked two hitters without recording an out.